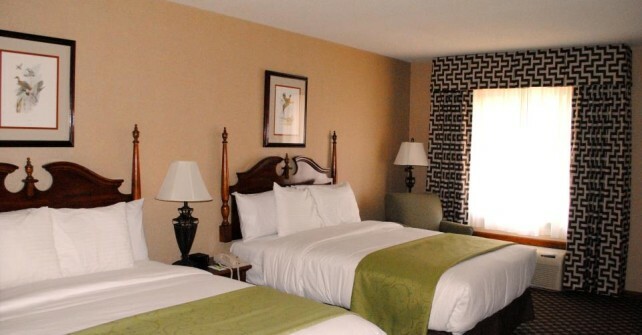 This spacious, comfortable, updated, non-smoking room assures a great night’s sleep with luxurious custom pillow top mattresses, 300-thread-count sheets, hypoallergenic comforters and four pillows on each bed. The room includes a cozy sleeper sofa and work space with a desk, ergonomic chair and complimentary ultra-fast wired internet. There is an iPod docking station; 32-inch flat panel HDTV with premium cable; microwave; refrigerator, coffeemaker; iron and ironing board; and a hairdryer. A complimentary hot buffet breakfast is served onsite at Merry Acres Restaurant.